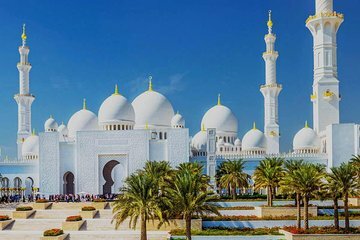 Travel to Abu Dhabi, the capital of United Arab Emirates, on this guided all-day tour from Dubai. Visit the Sheikh Zayed Grand Mosque (which is open to non-Muslim visitors), the Abu Dhabi Marina Mall, Emirates Palace Hotel, and the Heritage Village, which offers a view of the traditional Bedouin life. Plus, shop at the Old Carpet Souk and date market.